SAVE TIME, MONEY AND SPACE: Most meal prep containers don't last for a long time. They crack after a few uses and melt in the microwave. Not Freshware, our newly designed 21-pack bento box are built to be more reusable and affordable than our competitors. Stackable and space-saving design in the fridge or cabinet. 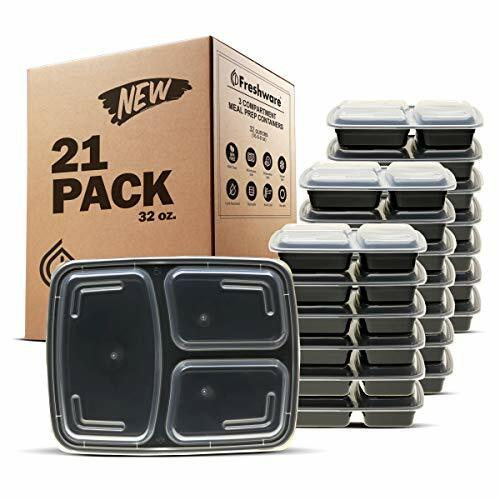 ENJOY A HEALTHY MEAL EVERYWHERE: Featuring meal prep containers 3 compartment, the lunch containers with portion control help you keep your 21 day fix meal plan and lose weight. Premium looking and versatile, the food storage containers can also be used as office meal containers and school lunch box. SAFE AND EASY TO USE: Made from BPA, PVC, and Phthalate free materials, these containers for meal prepping are 100% food safe. Airtight and leak-proof when closed, these lunch boxes can keep your food fresh and be easily opened using the convenient flaps on the lids. MICROWAVE, DISHWASHER AND FREEZER SAFE: Made of the highest quality food safe materials and robust designs, these bento lunch box can withstand temperatures from -40C to +120C (-40F to 250F), making them completely microwave, dishwasher and freezer safe! 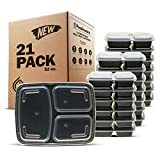 SATISFACTION GUARANTEE: Freshware food storage containers are meant to help you eat healthier and save money by cooking at home. In the unlikely case that your containers are not perfect for you, just send them back for a full refund or replacement!